Do you have a calendar in your home? Do you have more than one? Two, five, ten, well, ten is a little excessive, unless you have a very large home. I can see four from where I sit right now, but one is due to poor eyesight, the other has pictures of unique tools, one is due to laziness from last year and one is a family calendar of Hurricane and Tornado being cute a couple of years ago. I also have a big calendar in the kitchen that has all of the important dates for the year written on it. Every month, I transfer these important dates to a whiteboard monthly calendar, adding garbage day, sale dates and other one time things I deem important. Every year around December or early January, Louise and I will seek out some place that pop up in the malls just for this purpose. In the past few years, we have picked nature scenes that remind us what season it is. We could do the same by looking out the window I suppose but it is nice to see March in Vancouver with the flowers blooming while we poor cousins in Calgary look out at minus° weather and a foot or two of snow. Yeah…nice. 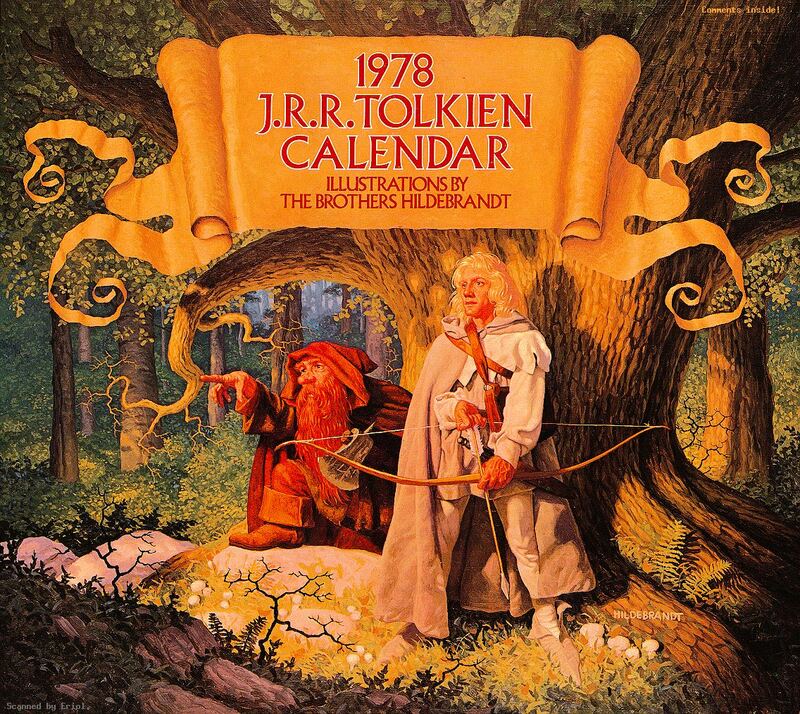 My favourite calendar is from 1978, paintings of Middle Earth by the Brothers Hildebrandt. These paintings were done long before Peter Jackson showed the world what Hobbits, Orcs, Dragons, Wizards and Ents looked like. We had to use our imagination and the paintings done by the Brothers Hildebrandt were the closest to what my vision of Middle Earth was. I still have that calendar in the bottom of a drawer somewhere; maybe I should dig it out. Now of course we all have calendars that are electronic. I have all of those important dates on my iPad, desktop and even on the phone I carry in my pocket. I have set up the computer calendar to send me reminders before all of those important dates so that I don’t have to actually remember them. I don’t have to remember when anyone’s birthday is anymore because if you are a friend on Facebook, I am told that your birthday is coming up in the next week and on the big day itself I get my final reminder. The truth is that most of these birthdays I wouldn’t have even known about in days gone by. Not that I wouldn’t want to wish my friends Happy Birthday, it is just that it took effort and forethought. It is easier now that I can use Facebook as an electronic secretary. I bet that I could set it up so that cards would be written and sent automatically to my friends and family without my even knowing it was their birthdays. If I were so inclined, I could probably input their sizes and preferences and my trusty computer would purchase, gift wrapped and express posted to their home in time for the big day. I could have friends and never have to interact with them at all. This is all in the future, but not too far into the future. For now, I am still living in the past. To my close family I will send or give a birthday card, the facebook friends get a ♫HAPPY BIRTHDAY♫ and anyone else will get a “Sorry I missed your birthday.” when I see them. I can’t help but think it was easier in the old days when calendars were made of stone and simply marked the coming seasons for the priests to plan their human sacrifices. Call me old school I guess.